Hydronephrosis is a nice thing to see. Generally speaking you know the diagnosis when you see it. When it’s severe it’s pretty obvious. One of the pictures here is from a patient with a blocked nephrostomy tube. The pelvis is basically blown up like a balloon in the center of the kidney. Not too hard to see this one. You may not think it’s a particularly good picture but when you’re scanning and the patient is breathing you’re getting a gestalt which all together says: “hydronephrosis”. Sometimes the hydro is subtle. I try to find the “glove” where it looks like a blown up surgical glove with stubby little fingers poking out. Sometimes I imagine I’m seeing hydro when I’m looking at the renal vessels which are more tree-branch like and light up on the Doppler. You can always look at the other kidney and compare (check the bladder too, for retention and bilateral hydronephrosis). When you see hydronephrosis, try to find hydroureter and maybe even a proximal ureteric stone (this takes a bit of fiddling). 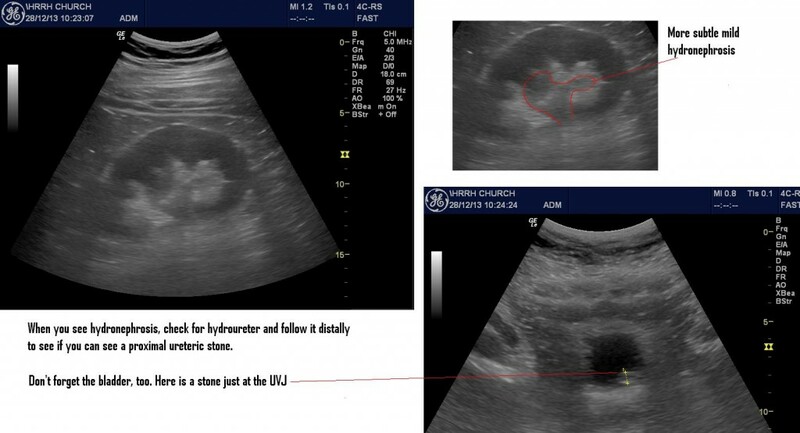 Then check the bladder for UVJ stones. If you have time you can even look for ureteric jets with the Doppler on (a bit time intensive). The other two pictures are of renal colic. One shows a stone at the UVJ. Also if you see a marked rise in creatinine (or even sepsis) it’s always good to check for hydronephrosis/bladder distention.